If you follow me on Instagram (@glino_clariza) you'll know that I recently received my Althea Korea box/parcel. For the first time in forever I bought makeup online and waited it to arrive. Today I will introduce to you Althea Korea Philippines and walk you through the process of ordering makeup plus an unboxing of my first ever beauty box. Althea Korea launched last February 15 for shopaholics in the Philippines. It is a popular K-Beauty shopping site that ships internationally from Korea to the Philippines. The famous brands they carry includes Tony Moly, Etude House, The Face Shop, 3 Concept Eye, Laneige, Innisfree, Iope and more. I got encouraged to buy makeup from the sites because one, I love anything Korean and two, I have never experienced buying beauty items online. This could be a great first time moment for me. 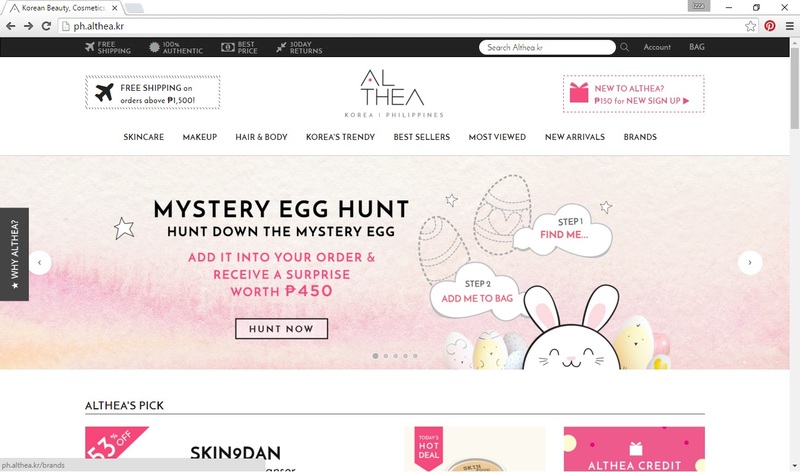 If you are looking for a one stop shop for all makeup, skincare, hair and tools fresh from Korea then go visit Althea Korea. The link to Althea Korea's website is ph.althea.kr. 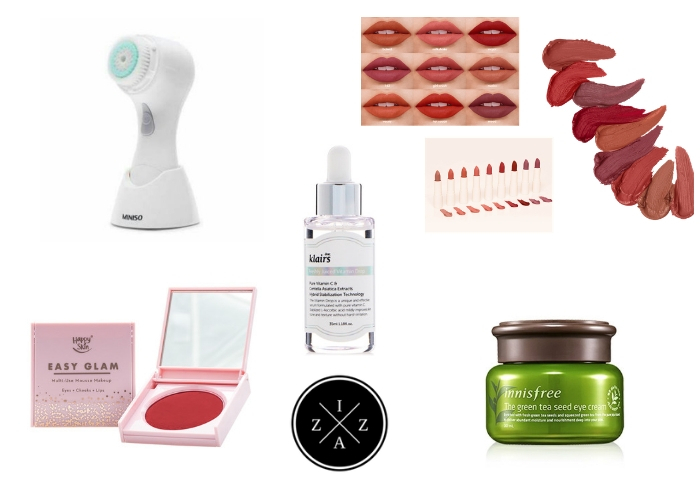 It is simple and easy to navigate beauty website. Upon entry you will have a pop-up subscriptoon box. 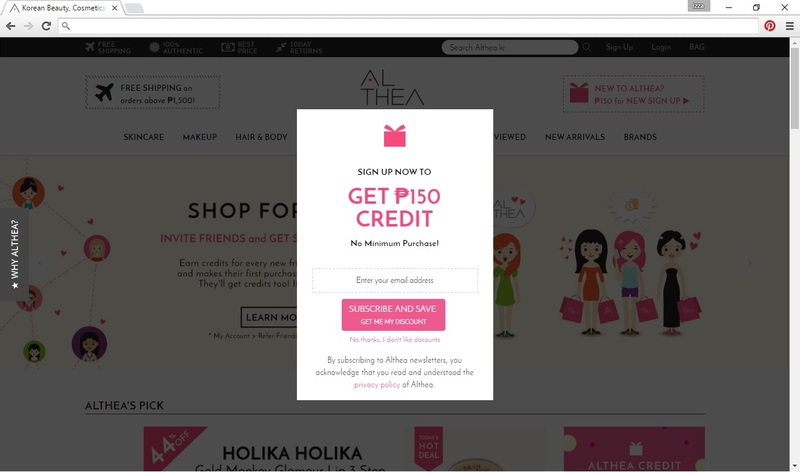 If you subscribe to Althea Korea's newsletter you are entitled to get a 150pesos off credit with no minimum purchase required. 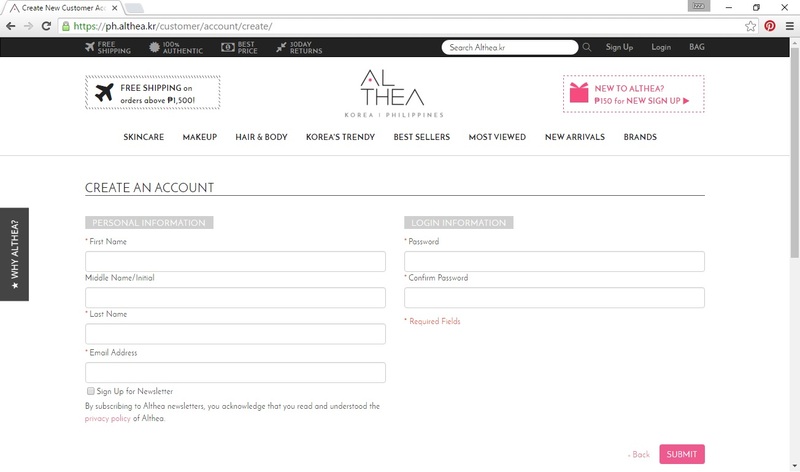 You need to create an account to Althea to process your orders. Fill in the needed personal and login information and click submit. You will receive an email notification that your account has been created. From there you can now start shopping. The products are filtered first by category from Skincare, Make and Hare&Body. It's nice that they also have direct page for Korea's Trendy, Best Sellers, Most Viewed, New Arrivals and Brands. This makes shopping a lot easier. Everything in the website is point and click. Once you selected a product you will be redirected to another page that shows detailed information and Add to Bag button. Check out is also very simple. The details of the price and quantity is available plus you have a Grand Total highlighted. If you are ready to check out you simply click Checkout. If there is/are item that you don't want you can easily clear and it will subtracted to the grand total real time. 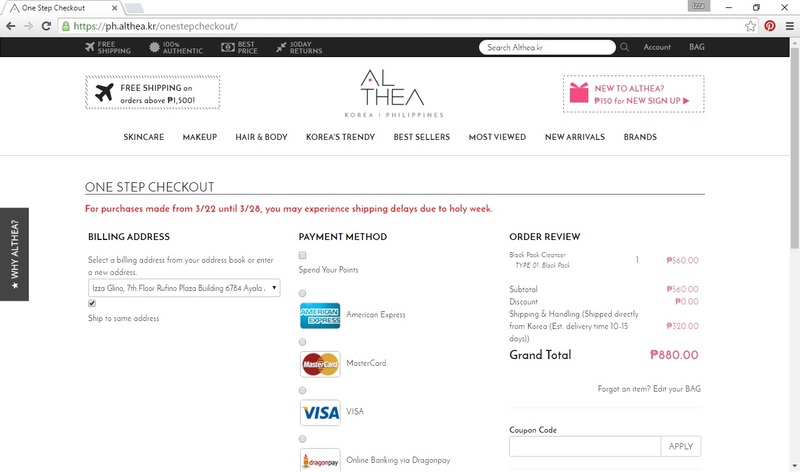 Althea Korea guarantees a one-step checkout process. Currently the only available payment methods include credit card which I know is a bummer. You can also pay through Paypal which is the method I used. Soon I hope (and all of us hope) that they'll cater bank method too. Now all the goodies you've ordered on the website will be placed inside the Althea Beauty Box. I will be unboxing mine towards the end of this post. The box is pink and girly and promises a secure packaging for your ordered babies. A small box is used for lipstick, tint and small number of products while a regular box is used for skin, lotion, cream and more number of products. Aside from the box each of the products you've ordered are tight wrapped with bubble wrap especially the delicate ones. Althea Korea promises free shipping from Korea for purchased items above 1,500pesos. If your order doesn't reach this mark then you have to pay for the price which will show on your Checkout page. Also it is worthy to mention that their delivery is door to door meaning you don't have to go to post office and deal with customs at all. Althea Korea promises 100% Authentic Product. All items found on the Althea Korea website are 100% authentic. 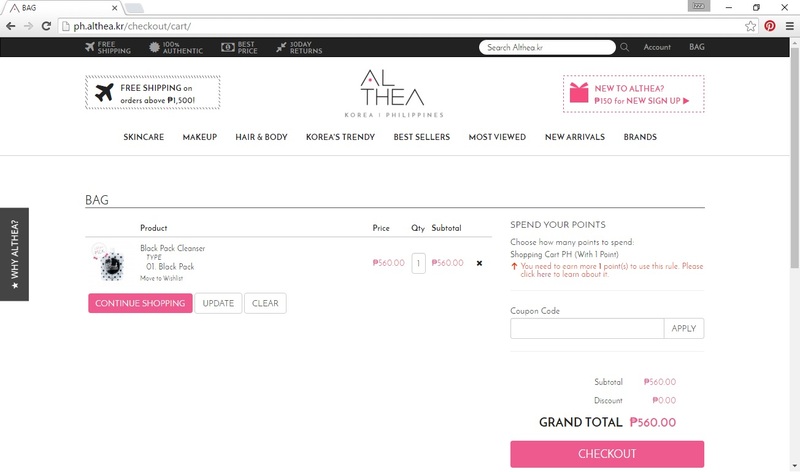 In case the product is confirmed fake, Althea will honor a refund double the purchase value. Althea Korea promises best price for their items. They are work directly to Korean make up brands so rest assured that the pricing are the best and lowest there is. 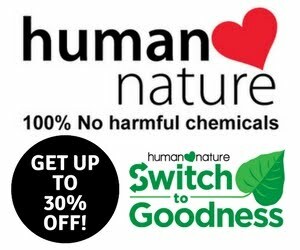 They also give percent offs on product and other deals like buy 1 take 1 or free item of the month. Althea Korea promises 30-Day Unconditional Returns. If ever you are not completely satisfied with the product you ordered for any reason there is, Althea Korea will issue a refund as long as it is within 30 days. I feel so kilig while doing this post because this is the first time that I will be doing an unboxing. PS. Please note that I purchased ALL ITEMS with MY OWN MONEY. This is not an sponsored post or whatsoever. I just love the service of Althea and thought it would be nice to make a blog post out of it. PSS. I purchased mine during their soft launch. They gave 300pesos for New Sign Up back then and Free Shipping for orders above 999pesos. This is a free item I got from Althea Korea as part of their monthly promo I believe. Retail price of this is 170pesos on the site compared to 198pesos from physical stores. I think this is the last item I added on my bag. I thought that my shopping can't be complete without a face makeup product more so a BB Cream. I've been wanting to try this for forever and glad that it is available with 58% off the price. I got this for 560pesos. Here's another Missha product that's on 52% off. Love that I got this for 190pesos only!!! I've meaning to try out a good undereye concealer/brightener because as everyone knows mine is dark and puffy. Will definitely make a review about this soon. This is a perfect skincare item now that the weather here in the Philippines is very hot. You just spray it onto face whenever you feel dry. It soothes and moisturizes the skin. Price is 260pesos. I am slowly running out of my Olay Pore Minimizer Toner and this is the next item onto my skincare. I am actually excited to use this product because anything to do with rice water as part of skincare works. Price for this is 190pesos. This is something new for me and I don't know how to use this at all. This is my first mineral powder product and I do hope it will do wonders for my face. The price is 260pesos. That's it for this post. Hope you like it. I will be updating this with a video of me unboxing fresh from my YouTube Channel. Again, a big thanks for reading. What do you think of Althea Korea? REVIEW | Belo Intensive Whitening BB Cream - New!